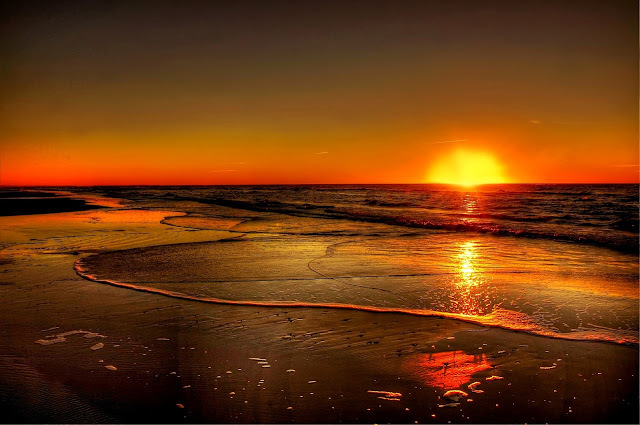 We aren't contributing new capital to our portfolio due to other needs for our cash; however, I was still able to make new purchase thanks to the dividends that have been received. That's what I'm talking about. Dividend growth investing is the gift that keeps on giving. On June 5th I initiated a starter position in a company that I've long had my eye on. I purchased 10 shares of The J.M. Smucker Company (SJM) at $105.65 per share. The total cost basis, including commissions, came to $1061.45 or $106.15 per share. J.M. Smucker is a Dividend Contender with 20 consecutive years of dividend increases. Smucker's most recent quarterly dividend payment was $0.78 per share. That puts the YOC for my position at 2.94% and I can expect to receive $31.20 in dividends over the next year barring any reinvestment or dividend increases. Due to this purchase my FI Portfolio's forward 12-month dividends are $6,285.54. How Does Smucker Make Money? J.M. Smucker manufactures and markets both food and beverages around the world. Some of the brands that Smucker sells or distributes for are Folgers, Smucker's, JIF, Crisco, Pillsbury and Hungry Jack as well as Milk Bone and a variety of other pet products. J.M. 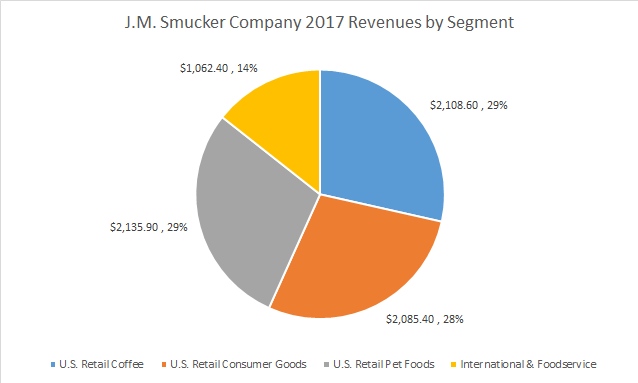 Smucker's product mix and #1 market share for 4 of it's brands it is firmly entrenched as a consumer staple. As a dividend growth investor any potential investment must prove to me that they have the willingness and ability to "show me the money". I judge that based on a company's history of both paying and growing dividends to shareholders. As I mentioned earlier, J.M. Smucker has increased dividend payments for 20 consecutive years. I like to examine the dividend growth rates over varying time periods. Since many businesses see their operations ebb and flow, even the consumer staples, this smooths out the dividend growth and can give an idea of how things could look in the future. The 1-, 3-, 5- and 10-year rolling dividend growth rates can be found in the chart below. J.M. 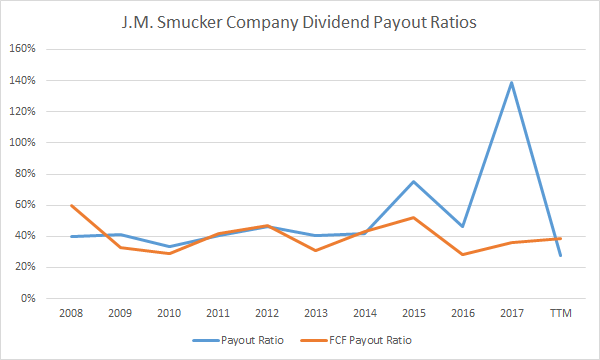 Smucker has historically been very consistent with their dividend growth since 2012. The following table summarizes the previous chart with data about the historic dividend growth. Of course there's also the matter of how safe the dividend is and you can tell that by looking at the payout ratio. Personally I like to examine the traditional payout ratio using earnings per share as well as the free cash flow payout ratio. As you can see the payout ratio has been relatively stable since FY 2008 hovering around the 40% mark for both earnings and free cash flow. J.M. Smucker the "business" has never been a problem rather it was J.M. Smucker the "stock". There's been very few times since I began investing where I had both cash ready to purchase and Smucker's valuation seemed right. The most recent swing low for J.M. Smucker was around $102 a level that was briefly touched in late 2017, but prior to that hadn't been seen since 2015. That doesn't necessarily mean that the valuation is better now; however, for a consumer staple that's continued to grow earnings and its dividend since 2015 it's a pretty good bet that the valuation now is much better than it was then. Using the P/E ratio the valuation looks attractive here. Based on 2017's EPS of $7.72 shares are trading at a 13.7x P/E. Using estimates for FY 2018 and FY 2019 the P/E's come in at 12.9x and 11.5x, respectively. For some perspective the 5 year average P/E, according to Morningstar, is 24.3x. Analysts are currently projecting earnings to grow by 6.6% per year for the next 5 years. On the dividend yield front shares look attractive as well. The 5 year average yield has been 2.3% and shares are currently trading hands with a 2.95%. Even better is that J.M. Smucker should also be announcing a dividend increase in July giving an immediate boost to the yield. Using $3.12 as the starting dividend, my cost basis of $106.15 and a 10% required annual return, J.M. Smucker needs to average at least 6.85% annual dividend growth in order to support my purchase. It's been a long time coming to add J.M. Smucker to my portfolio and I'm glad to add shares at nearly a 3.0% yield. The valuation looks attractive here and I believe that an investment here should treat me well over the years. I still have enough cash on the sidelines for one more small purchase and there's a few companies that I could see myself adding soon. Johnson & Johnson (JNJ), Pepsico (PEP) and even adding more to my new position in Smucker. Altria (MO) is another name I'd consider, but I'd like to see the share price in the low $50's before adding another slug. What companies are on your radar for purchases? What do you think of my purchase of The J.M. Smucker Company? Do you own shares or are you interested in adding shares of the company to your own portfolio? I like Smuckers. It's so hard to own all these great consumer staples companies. Nice pick up. The consumer staples are definitely looking more attractive over the last couple months. I missed the dip down below $100 for SJM but it was pretty short lived. I'm glad to finally have at least a little bit of skin in the game with them. Obviously I think it's a pretty good value here. Not great, but I'd say there's fairly few investments right now that are great from a valuation perspective. I'm looking forward to seeing what that first increase is in July. It feels good to start adding, albeit slowly, once again to my portfolio. Great pickup PIP! I always have my eyes on SJM since it is a local company. I can't remember a time where their yield was over 3%. Love the company, love the brads. It is all great stuff. Enjoy the purchase my friend!! Much like you I don't think I've ever seen a 3% yield for SJM until recently. If we see a dip back below $100 I might you some of my free capital to add some more shares, but either way I'm pretty happy to add this great consumer staple to my portfolio finally. Even better is the upcoming dividend raise which should be announced next month.